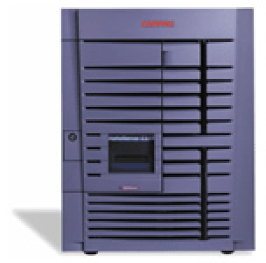 The Compaq HP AlphaServer ES40 Model 2 delivers the high performance of the Alpha 21264 processor. Available in 6/500, 6/667Mhz and 68/833Mhz versions, AlphaServer ES40 systems from Island Computers are completely refurbished, rigorously tested, and come with a 12 months warranty. The AlphaServer ES40 Model 2 has quad processor capability and supports up to 32GB memory. You can configure an ES40 model 2 with a wide range of accessory cards, memory options, and internal and external storage options Offered with CPU speeds of 500, 667 OR 833 MHz. 3 Power Supplies (2+N) for redundancy.